Thymer is a dead simple todo and project management application that is currently in beta. I got my invitation and i was testing the application, thymer is as simple as it can get to use it. The interface is clean and Ajaxified and simple to use. You donâ€™t need to know any complex project management things, create projects, todo lists, reports in the same interface. The app is impressively fast. You can use shortcuts to post tasks like instead of entering date you can enter @Tomorrow, it will recognize and create the task for tomorrow. You can create single or multiple tasks at a time and drag and drop the tasks for easier organization. Each individual task can have comments. You can categorize (sort of) the tasks with 4 types, discuss, important, billable and waiting for. You can set log time also for the tasks if you wish. You could also use tags to subcategorize your tasks for better organization if you have lot of tasks. 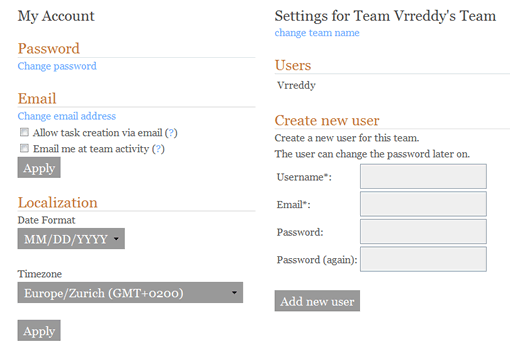 Other features include team management, you can setup a team by adding users for project collaboration with your colleagues. This is a cool web application for managing tasks in a dead simple way. Check it out currently it is in private beta and free for now, but in future it may have subscriptions. I donâ€™t have many invites they gave me 3 extra invites so if you want to try comment here i will send you one. Knowing me, even that wouldn’t help! Lol, oh well. But it sounds like a great tool. I should look into it. I would like to try, sounds great! I’ve been trying out 10 different TODO list tools, and I’m not really satisfied yet.